Ten people, including a YouTube star, have been diagnosed with dengue fever in Hawaii. Allie Wesenberg and Charles Trippy, who host the YouTube show “Internet Killed Television,” were vacationing in Hawaii when Wesenberg began showing symptoms of the tropical disease. Dengue fever is also known as bone break fever because of the pain associated with becoming infected. 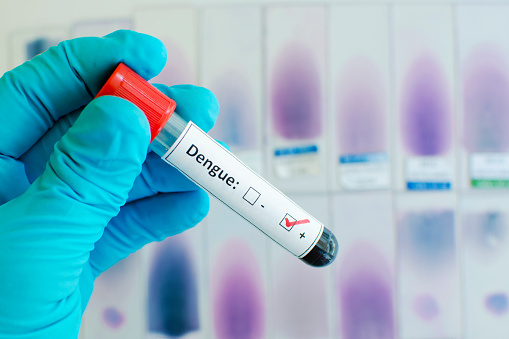 The Centers for Disease Control and Prevention (CDC) estimates there are approximately 100,000 million cases of dengue fever worldwide every year. The disease is spread through human contact with mosquitoes, typically in tropical environments. In addition to the overall body pain it causes, symptoms include bleeding from the gums and nose, rashes, severe headaches, and pain behind the eyes. Experts are concerned the fever will become native to Hawaii, which is why they are pressing to stop this outbreak as quickly as possible. It takes about five to six days after being bitten before any symptoms of the fever begin showing. A full recovery is typically made within two weeks. Wesenberg and Trippy have been working with Hawaii health officials to handle Wesenberg’s infection. Her weakened immune system forced her to wear a mask to prevent any further illnesses. Assumptions from Hawaii health officials are that an already infected individual came to the island and was bitten by a mosquito that stored the disease and eventually passed it on by biting other residents and travelers. Mohney, G., “YouTube Star’s Dengue Fever Infection In Hawaii Highlights Dangers of Tropical Disease,” ABC News web site, November 3, 2015; http://abcnews.go.com/Health/youtube-stars-dengue-fever-infection-hawaii-highlights-dangers/story?id=34948159. Ranosa, T., “Two YouTube Users Document Their Battle With Dengue Fever,” Tech Times web site, November 4, 2015; http://www.techtimes.com/articles/102062/20151104/two-youtube-users-document-their-battle-with-dengue-fever.htm.